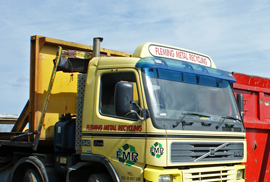 Not only does Fleming Metal Recycling deliver The Best Deal for Scrap Steel, We Collect. With our extensive fleet of recovery, skip and collection vehicles, FMR provides a comprehensive collection service for scrap metal throughout Ireland. Given our extensive experience, at FMR, we recognise that scrap metals and end-of-life vehicles can often be difficult to recover and transport. For this reason and to increase customer convenience FMR offers the complete recovery, collection and skip hire service. As per our commitment to customers, who visit our recycling centres, FMR provides a fully traceable and transparent collection service. Through our CCTV network and computerised weighbridge ticketing, you, our customer, can have full confidence in the service we provide. If you need assistance in the collection and transport of your scrap metal, irrespective of whether you need a one-off collection or regular skip provision, FMR can provide the tailored service that you require.